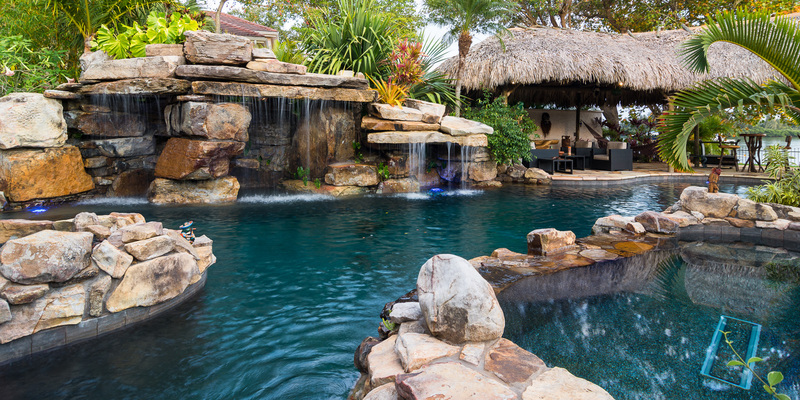 The best Lucas Lagoon yet? 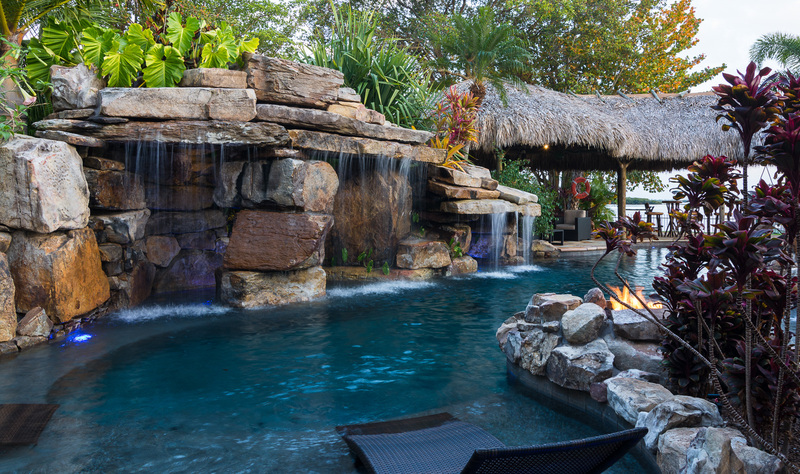 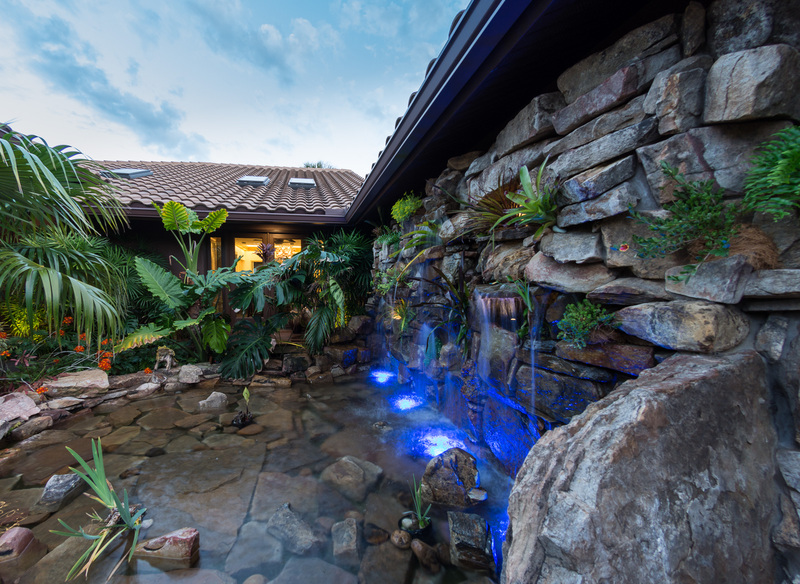 Well, it’s definitely one of the best outdoor living spaces we’ve completed with an amazing rock waterfall pool, massive tiki hut, walk-through stone pool grotto and even an outdoor shower built out of boulders. 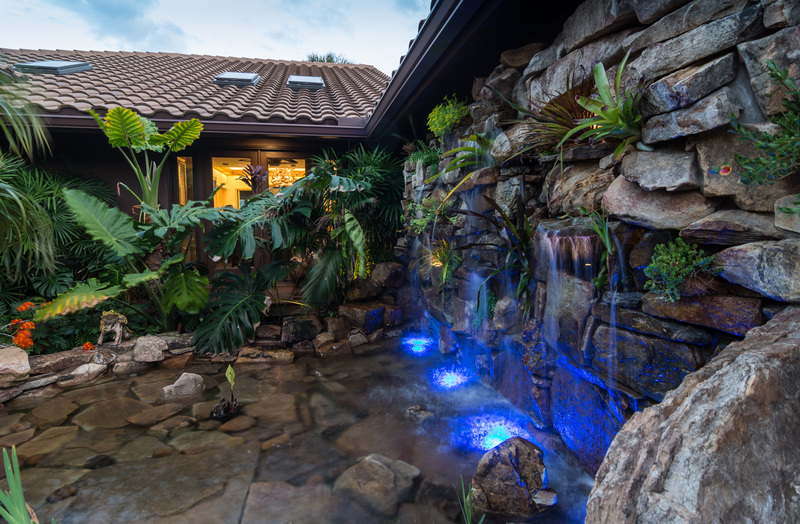 But the swimming pool is just part of this complete exterior design project on Siesta Key. 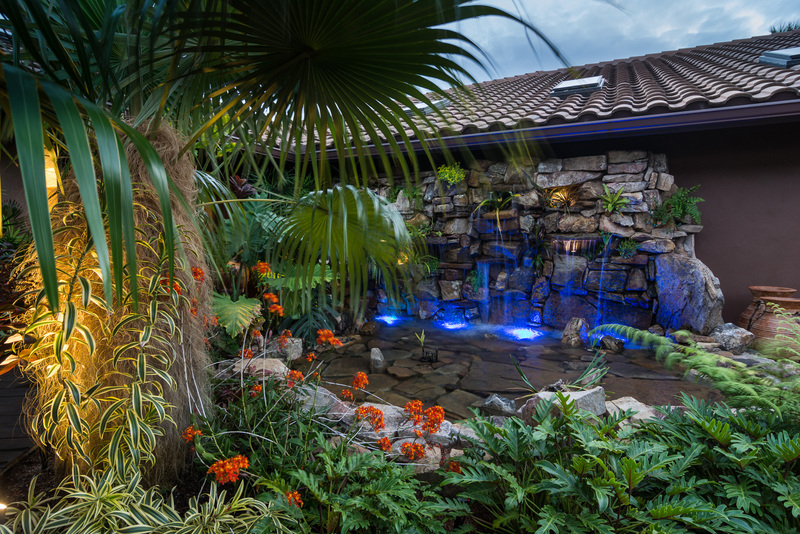 The clients started with an amazing property and hired us not just to build a rock waterfall pool, but to design a luxury outdoor living space that brings the tropical feel of the property to the house, out to the pool and and beyond to the views of the bay. 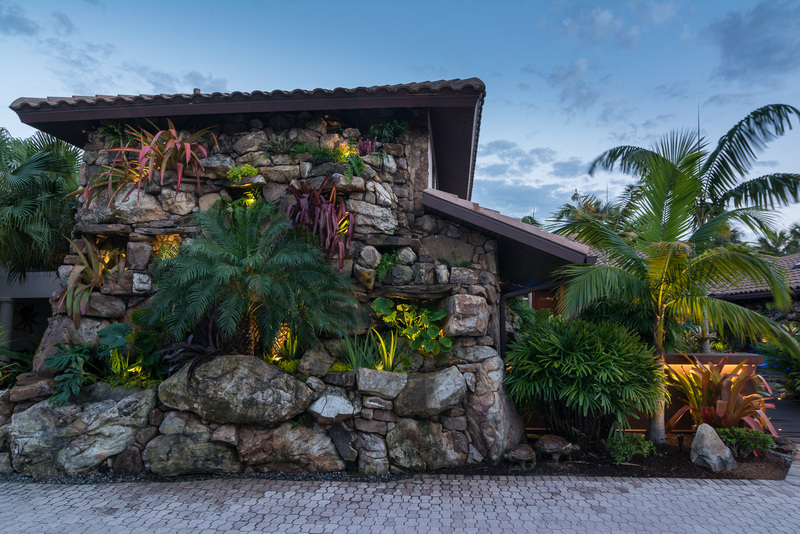 The moment you step foot through the gate you are welcomed by a grand drive, complimented by a massive rock veneer wall built from boulders, filled with natural stone planters and finished with luxurious tropical landscaping. 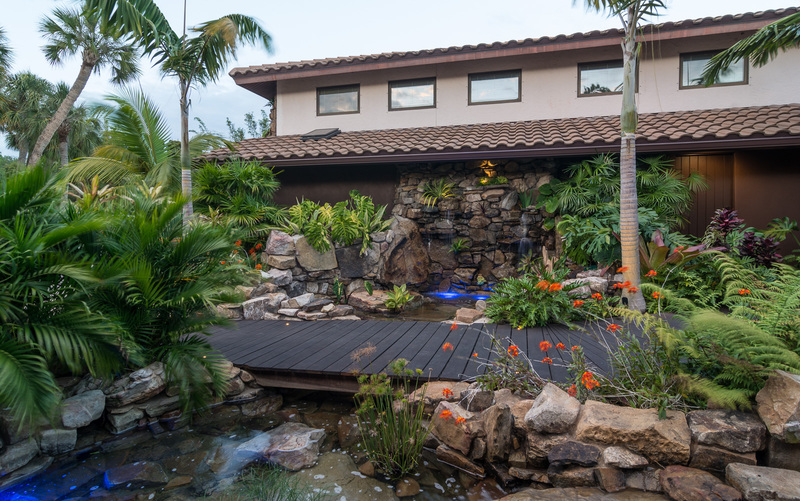 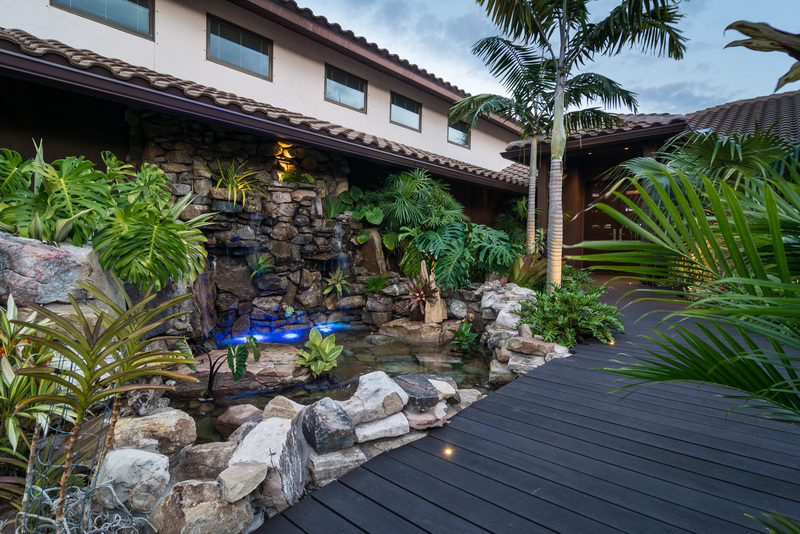 The grand stone veneer wall gives way to an entrance of equal luxury, a pathway of Ipe wood decking crosses a stream, babbling between two flowing water walls, through exotic tropical landscaping to welcome you home. 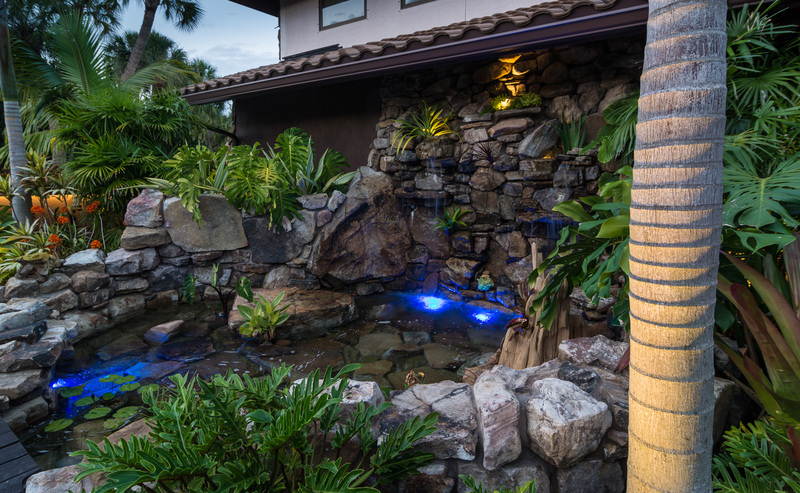 Beyond the grand stone veneer entrance, a breezeway opens to a stunning outdoor living space with views of Sarasota bay. 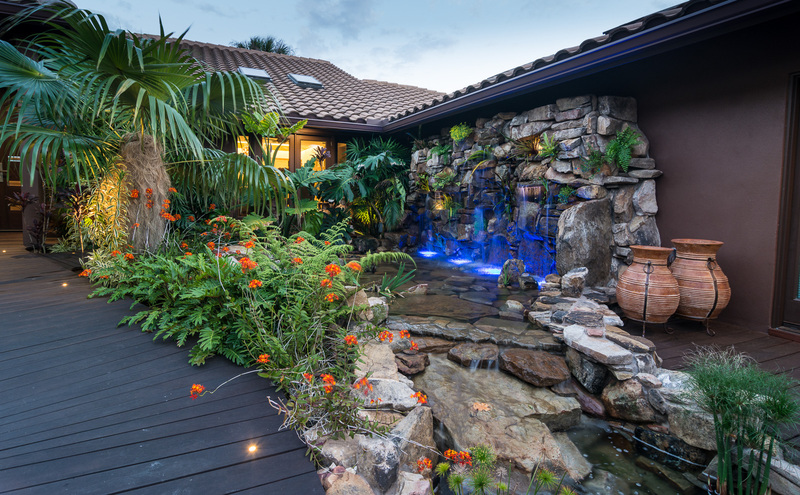 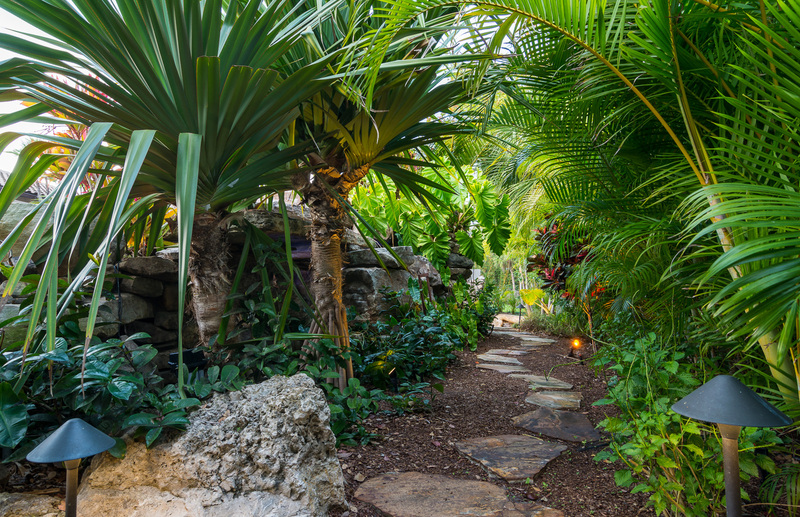 Over 1,000 square feet of flagstone decking lays right up to the edge of the rock waterfall pool, the stonework continues around to an outdoor shower made with three large boulders and massive stone steps to a secret tropical pathway behind the pool grotto. 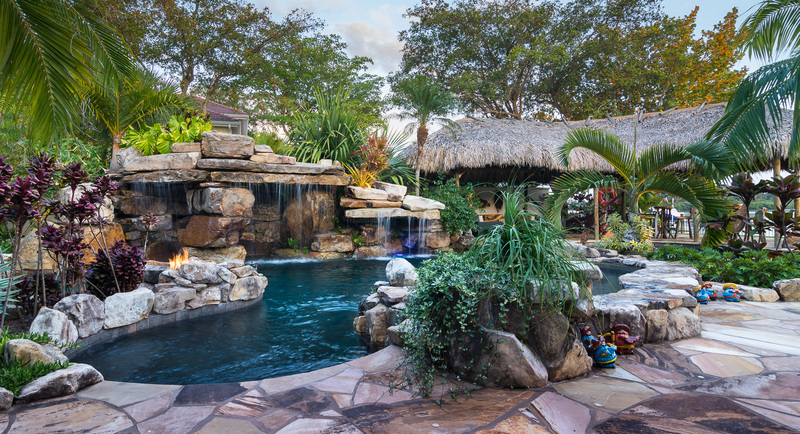 From here behind the pool grotto you can climb the grotto rocks and jump into the swimming pool, or meander your way to the tiki hut. 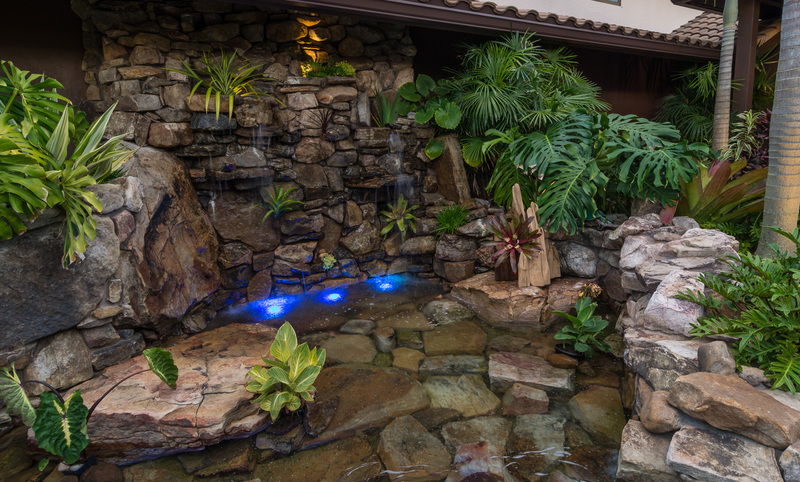 Once in the pool, the swim up ledge in the pool grotto can be accessed from the swimming pool’s sun shelf and is large enough to stand in. 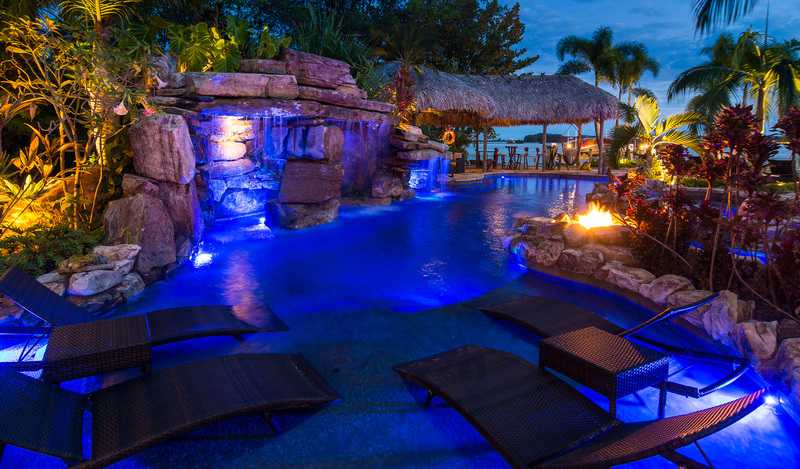 If the walk-through pool grotto doesn’t make this one of the best lagoons in Florida, there is a fire pit peninsula between the lounge chairs on the pool’s sun shelf and the in-pool seating cove next to the oversize spa. 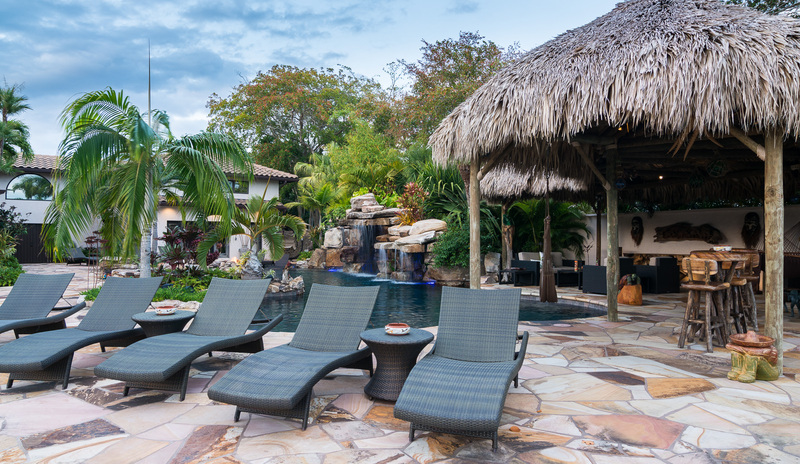 From the spa we make our way to the amazing pool deck area, with room for multiple chaise lounges to soak in the sun, the pool view or the bay vista, docks and beyond. 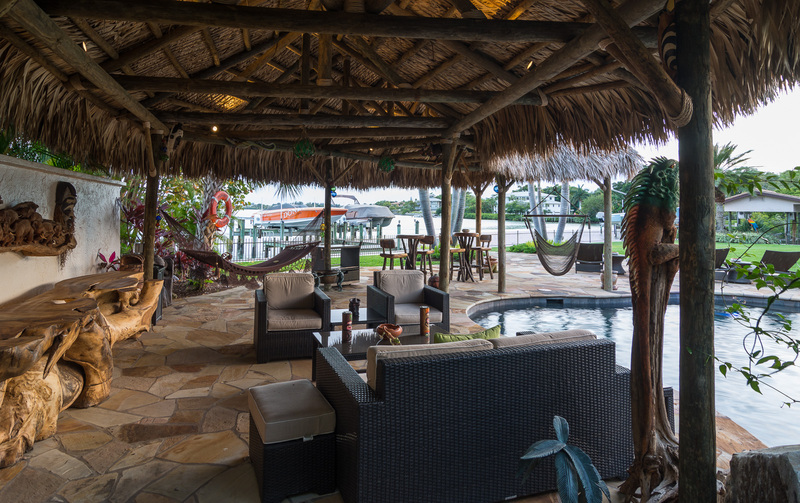 Back poolside, the oversize tiki hut has a hammock, outdoor deep seating with tables, art and more. 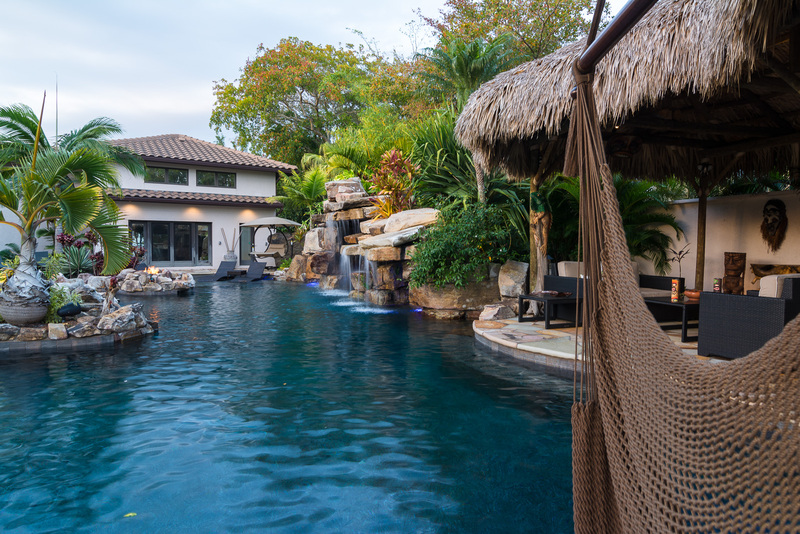 This lagoon swimming pool build wouldn’t be complete without amazing Florida pool landscaping done by one of the best landscapers in Sarasota to compliment Lucas Lagoons custom pools. 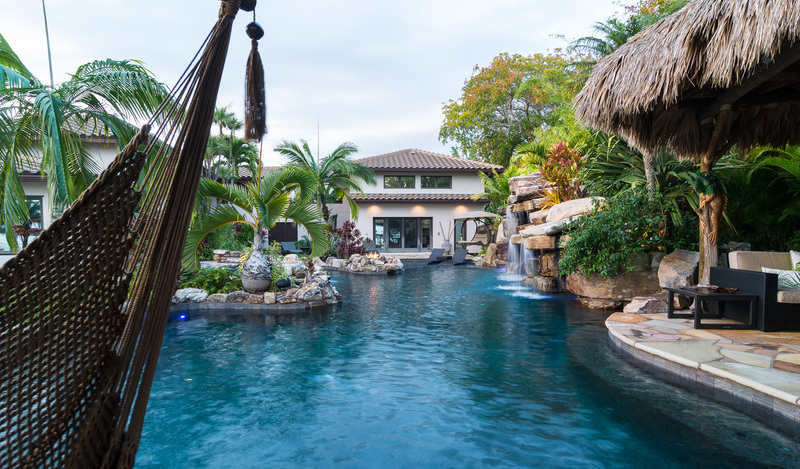 All of this comes together to make one of the most amazing pools in Florida, and definitely one awesome lagoon waterfall pool in the Sarasota area.